With more than 15 Fortune 500 companies, one of the busiest airports in the world, and a cadre of world-class restaurants, Atlanta is a cultural epicenter of the American South. Nicknamed “The City in a Forest,” Atlanta’s urban sprawl also harbors more than 300 parks and green spaces. If you’re going to be spending time in Georgia’s capital city, make the most of your time with this list of things to do in Atlanta. As the hometown of Dr. Martin Luther King Jr., Atlanta was central to the Civil Rights Movement of the 1960s. In 2007, Atlanta honored this history with a 42,000 square-foot museum dedicated to civil and human rights. Known as the National Center for Civil and Human Rights, this educational facility houses a variety of collections dedicated to Dr. King, the American Civil Rights Movement, and the global struggle to protect human rights. Buckhead, an upscale Atlanta suburb, contains three of the city’s largest shopping malls. Lenox Square, Phipps Plaza, and Shops Around Lenox cater to a wide variety of tastes and budgets. The Lenox Square Mall is a traditional shopping center with sprawling department stores like Neiman Marcus and Bloomingdale’s. Across the street, Phipps Plaza houses several luxury brands, including Gucci, Prada, and Louis Vuitton. Last, but not least, the Shops Around Lenox include several smaller retailers like American Apparel and Cosabella. With more than 180 acres, Atlanta’s largest recreational area is home to some of the most popular festivals in the city. Visit Piedmont Park in August to experience the largest multicultural event in Georgia–Festival Peachtree Latino celebrates Hispanic-American culture with more than 250 exhibitors, performances, and vendors. Held in September, Music Midtown is the next major event in Piedmont Park. Buy a ticket to see artists like the Alabama Shakes, Lil Wayne, and DNCE. Rounding out Atlanta’s festival season, the Atlanta Pride Festival takes place in October. Since opening in 1997, Eddie’s Attic has springboarded the careers of several musical acts, including John Mayer, Sugarland, and The Civil Wars. This popular venue is located in Decatur, a small, artsy town in the Atlanta metropolitan area. Eddie’s claim to fame is a listening room with superior acoustics and a no-cellphone policy. In addition to discovering local talent, visitors can also listen to famous singer-songwriters like Edwin McCain, Brandi Carlile, and Ani DiFranco. 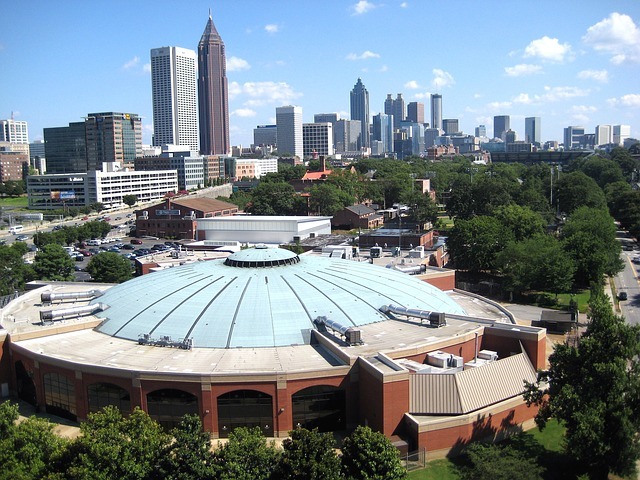 Atlanta is home to six professional sports teams and a host of top-notch venues. Sports enthusiasts can watch the Atlanta Falcons play in the Georgia Dome or the Atlanta Braves play at the new stadium, SunTrust Park. You can also catch an NBA or WNBA game in the Philips Arena. In addition to professional sports, Atlanta offers a host of other sporting events, including motorsports, soccer, as well as a variety of college sports. Atlanta’s High Museum of Art is the one of the premiere art museums in the American southeast. Visiting art buffs can appreciate more than 15,000 works of art by world-renowned American and European artists, including Monet and Degas. The museum also features a growing collection of artwork by African-American and Southern artists. On Friday nights, visitors can experience live music and other special events. On the east side of the city, Stone Mountain Park encompasses 3,200 acres of green space. It is also home to the largest piece of exposed granite in the world. With attractions ranging from hiking trails to cable cars, Stone Mountain Park is one of Atlanta’s best outdoor attractions. Popular events include the Yellow Daisy Festival, the Indian Festival Pow-Wow, and Summer at the Rock. Over the years, Atlanta has invested in culinary tourism. As a result, the number of locally owned restaurants has skyrocketed, especially near Intown Atlanta. Indulge your inner foodie at restaurants owned by celebrity chefs–Richard Blais’ FLIP Burger Boutique and Kevin Rathbun Steak are two popular choices. Alternatively, visit the “Buford Highway,” a strip of the DeKalb International Corridor for diverse, ethnic cuisines. Built in preparation for the 1996 Olympic Games, Centennial Olympic Park is home to several of Georgia’s top attractions. The park is home to green grass, tall trees, and a fountain shaped like the Olympic rings. However, the park’s true draws are the museums that line its perimeter. To the west, visitors can find the Georgia World Congress Center, the College Football Hall of Fame, and the CNN Center. The Georgia Aquarium and the World of Coca-Cola are located to the north.